Since 2014, I came to learn of two new creatures classified within cryptozology. Back in January of that year, a friend informed me about Batasquatch which I believe maybe another internet fabrication after hearing about Sheepsquatch. Articles about both creatures are posted on Abnormal Realm. In addition, I became aware of the other cryptid, atmospheric beasts, being the main subject of this article. Atmospheric beasts are the strangest of creatures yet classified within cryptozoology. They are reported to be living organisms inhabiting the earth’s atmosphere flying without the need for wings. These creatures are believed to be lighter than air spending their entire life within the sky. Some cryptozologists theorize the atmospheric beasts to be either low-density or filled with gases, such as hydrogen, allowing them to fly or float. These creatures have been described to appear in the shape of balloons or clouds. This led to speculations atmospheric beasts may possess the ability to change size, density and even colour. Also, eyewitness accounts of these organisms mention some with tentacles, snake like shapes and even resembling a jelly fish. Such accounts may indicate the life-forms have invertebrate’s bodies. In my research, several cryptozologists have claimed to classify several atmospheric beasts as sky serpents, atmosphere jellyfish and flying rods. These flying rods caught my interest, as only pictures and videos reveal their existence. They are speculated to be completely naked to the human eye. These creatures are described as unified cylinders, different in lengths with what appears as hairs, fins or tiny wings along the side of the body. 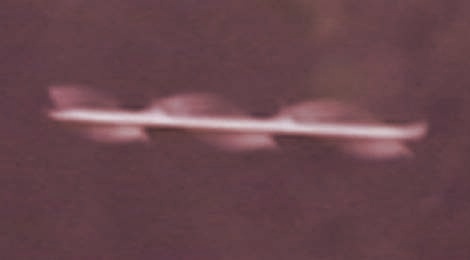 The presence of flying rods became widely known in the 1990s through the Internet. This entry was posted in Cryptids and tagged Cryptids, Cryptozoology on June 26, 2016 by Gatekeeper. Now this is a new category of paranormal creatures. Makes you wonder what more could exist within this world. Scroll down to the second photo. Pretty bizarre! I heard of Wilhelm Reich’s theories on orgone energy and up until now I was not aware of this story. Thanks for sharing. Also followed the link and the image is very creepy. I live that image. I did a blog post on it several months ago. True or not, I think it’s a creepy story and photograph! The “flying rods” are actual living creatures. However, they aren’t cryptids. Their origins are quite prosaic. They are normal, fast flying, insects which have been captured on a film using a slow shutter speed. Their stretched out form and apparent multiple wings are merely photographic artifacts created by the shutter’s slow speed. This can be proven empirically. The next time you see flying insects, simply set your shutter speed to a low setting and start clicking off a few images. You’ll be amazed at the results.